Steven Gullotta Though YouTube is a gigantic collective with 90% of what appears on the website trash there are little glimmering bits of hope that shine brightly amongst the stars. Well, maybe in this case the star isn't so bright as what I'm about to discuss is a morbid tale of fascinating curiosity and mystery. The Jester is a short horror film that I stumbled upon whilst browsing YouTube. I was watching something completely unrelated but there that Jester was staring me in my face; how could I say no to something so fun looking? So off I went clicking on the link to the video and I was transferred to MakeDo Entertainment's work of art. The short film begins off with a frightening tone as the music of polish composer Rafal Gosciminski makes it clear this is not a Halloween tell to tell the kiddies at night. We soon meet the man of the night - a late night worker just getting off shift who really isn't in the Halloween spirit. Whether or not this was caused by a traumatic childhood event or just utter bitterness for the happiness of mankind is unknown. Either way, he soon meets the titular Jester who wears a patchy suit, a wicked top hat, and an absolutely hypnotizing mask with a wide grin. 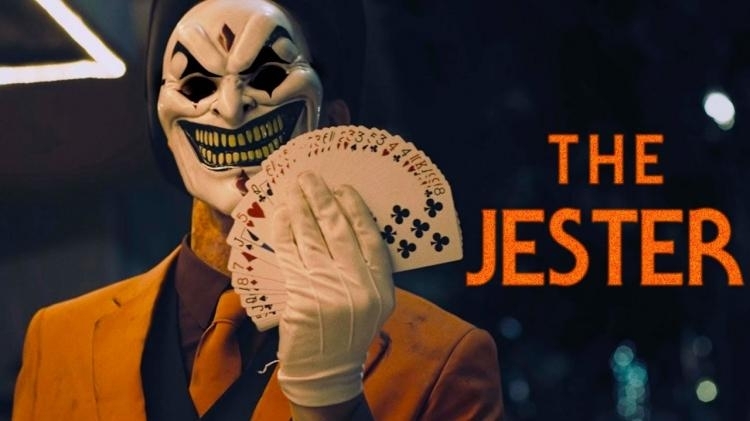 After being less than enthusiastic after the Jester pulls off a couple of tricks, the late night worker is soon running for his life as the Jester plays mischievous tricks on the man which include tying his shoelaces, handcuffing his hands, and getting him hit by a car. Now while the late night worker plays a plausible victim, it's the Jester in this short who really caught me by storm. I loved his manners, his costume, and his overall gleam. Even when his tricks don't go appreciated he finds a way to make himself appreciate his own tricks. On Halloween night where it's all about tricking or treating, The Jester is all about tricks. What got me really going was the ending. After the Jester is finished with the late night worker, we see two other young gentlemen dressed in costume from the beginning of the short. The Jester stops them, performs a trick, the two guys cheer him on and appreciate his work, and the Jester is pleased. He let's them go. All he wanted was to be appreciated. And as a friend of mine said after watching this short, "Moral of the story: always support indie artists." Though YouTube is a gigantic collective with 90% of what appears on the website trash there are little glimmering bits of hope that shine brightly amongst the stars. Well, maybe in this case the star isn't so bright as what I'm about to discuss is a morbid tale of fascinating curiosity and mystery. The Jester is a short horror film that I stumbled upon whilst browsing YouTube. I was watching something completely unrelated but there that Jester was staring me in my face; how could I say no to something so fun looking? So off I went clicking on the link to the video and I was transferred to MakeDo Entertainment's work of art. DreamReaper Releases New Dark Synthwave EP "Astro Blaster"